When it comes to making choices, do you seek to avoid or control yourself, others or the situation inappropriately? Do you seem unable to forgive others or yourself? Stop letting the illusion of short-term gain lead to long-term pain. 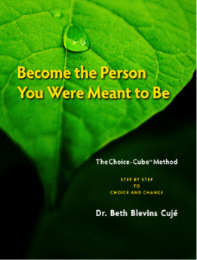 Try the Choice-Cube® Method: The Mechanics of Staying Connected, Honest, and Compassionate to create positive afformations,®* to program your subconscious mind for change and transform your life. THE AFFORMATIONS®* TOOL is a great place to start if you are stuck in the old patterns. The Afformations®* Tool challenges the subconscious mind with powerful questions to ponder and bring into reality. Affirmations vs. Afformations® We have been taught to use“affirmations” or positive statements to get what we want. The problem is, “affirmations” often don’t always work. Why? Because often we are simply trying to convince ourselves of something we do not believe. An established negative belief will always overpower an affirmation, even without our awareness. In contrast to affirmations, Afformations® are empowering questions (not statements) that immediately change our subconscious thought patterns from negative to positive. How does this work? Our brains are hard-wired to search for answers to questions. Because of this, questions engage the “automatic search function” of our mind. Thus, asking positive and empowering questions immediately changes the focus of both our conscious and subconscious minds from what we DO NOT have want, fear, etc.) to what we DO have, want, and hope for. NOTE: The point of using Afformations® is NOT to answer the new questions we are asking. The point of using Afformations® is to use our mind in a new way— to focus on what we HAVE instead of on what we FEAR or LACK. 2. Why am I enough? 3. Why am I good enough? 4. Why do I have what it takes to succeed? 5. Why do I have the courage to do what I love? 6. Why does opportunity come to me so easily now? 7. Why do I enjoy so much success? 8. Why does having what I want help others get what they want? How is it that God provides for all my needs? How is it that I can rest in God’s love, peace, and joy? How is it that I am good enough with room to grow? 2014 Choice-Cube Publications LLC. Licensed under Creative Commons Attribution 3.0 Unported License Reproduction. Copying or redistribution is encouraged provided the attribution Choice-Cube Publications is preserved. Click to Find Answers to Your Questions in the Book!